McKee's 37 Trademark Carnauba Paste Wax for a sizzling show car shine on your daily driver! McKee's 37 Trademark Carnauba Paste Wax replicates the look of premium car waxes without a premium price. McKee's 37 Trademark Carnauba Paste Wax is made of pure No.1 grade ivory carnauba from Brazil and engineered polymers to create a wet, glossy shine that lasts longer than carnauba alone. You’ll love what it does for your vehicle’s paint. Will not stain plastic trim! McKee's 37 Trademark Carnauba Paste Wax isn’t just a name; it reflects the superior performance of the wax. 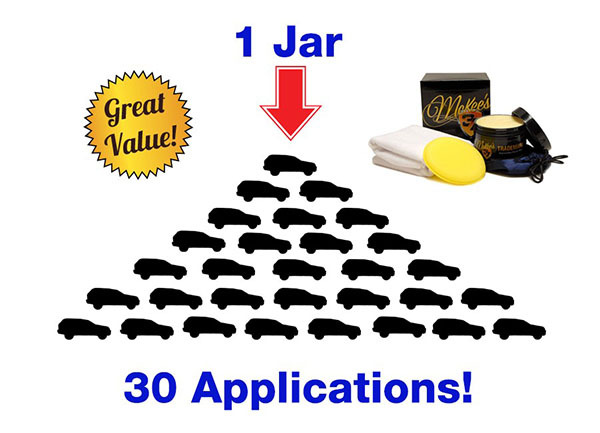 Some carnauba-based waxes cloud or turn yellow with subsequent layers. McKee's 37 Trademark Carnauba Paste Wax contains a purified carnauba with clear, reflective polymers that allow you to layer it as many times as desired to achieve the look you want. Even one coat is impressive, but additional layers increase the depth and multi-dimensional shimmer of your paint. Layer McKee's 37 Trademark Carnauba Paste Wax over a long-lasting sealant like McKee's 37 360 to get the best of both worlds: shine and protection! McKee's 37 Trademark Carnauba Paste Wax delivers the wet look that is so popular on show cars and collectibles. We dare you to compare Trademark to any carnauba paste wax on the market. For outstanding shine and value, nothing comes close. McKee's 37 Trademark Carnauba Paste Wax will take your vehicle’s shine to the next level! Includes Arctic White Microfiber Towel and 1 poly foam wax applicator. micro beads 4 I like the ease of application and removal. Also, when water hits the surface, the beads are really small. Not sure if that matters but is really cool. Cons:surface does not feel slick even shortly after application. I Love This Wax 5 I am on my forth container. I will never use anything else! This is the best wax you can buy! Pros:It is so easy to use and the shine is amazing! Great product 5 Used on my wife's Edge first. Made the metallic white look outstanding. Then my new F-150. Never thought before that silver could ever look that good. Unprecedented performance 5 McKees 37 has done it again with this extraordinary wax. It applies fwith ease especially with a dual action buffer. Water beads up tight and consistently. I will definitely buy this in the future and make it my go to paste wax. The shine is unprecedented. I could not be happier with this high performance Product. McKee 37 Carnuba paste wax 5 This gives a deep shine on my Black 1938 Ford. It has helped me win car shows for best paint job. Superior Product 5 Best carnuba paste wax that I have purchased and used in the last 60 years. I use McKee's hi def sealer first and then layer it with their Trademark Carnuba past wax. My 41 Willys, 54 Austin Healey, and 1966 AC Cobra have never looked better after using McKees. Pros:Creates a super slick surface. Bugs, tree and bird droppings just wipe off. I have purchased duplicate McKee's for my son to use on his new Corvette. He is thrilled. Recommended to all my car-nut friends. Great quality wax for the money 5 My car gets totaled, my wife ends up with the new car and I inherit hers. I didn't have the time to properly clean it and apply the coating to it, but I wanted to put some protection on it. I have had this for a year now and had not used it yet. So I thought since it is a WOWO wax that I could do a quick wash and give it a little protection to protect the paint against the birds and pollen blowing around. It went on and off fast and easy. And since the high heat hadn't kicked in around here yet, it lasted about a month and half. Can't gripe about that kind of longevity from a carnauba wax. And since I was rushing the process a little got on some trim. But it was no problem, did not stain and came right off. Pros:Very easy to work with. Nice shine, even if it is boring white paint. Cons:None that I have came across. Where was this when i had my GTO? 5 I have used a lot of different waxes and polishes. NOTHING is anywhere near as good as McKee's 37 Carnauba Wax. It goes on so easy and comes off just as easy. Shade or sun, it doesn't matter. it is unbelievable how the water just rolls off. I had a bird do it's thing on my hood and it sat in the sun for several hours baking. I took a microfiber towel with just a mist of McKee's Fast Wax and it actually came right off leaving no spot or stain. it literally slid off. I am so impressed with this and the whole line of McKee's products. I wish they would have been around in 1966 when I had my GTO convertible. I use all their products on my 2016 Ford F150 Super Crew with Pearl White Metallic paint and it is beautiful. Pros:Easy to use, works just as advertised. awesome 5 Lots of choices for paste wax out there...don't pass this one up. Super easy to apply and remove, and not having to wait for a haze is a big plus. Tested this against Souveran Signature Series II, and they're comparable as it pertains to ease of use, with the edge going to McKees. Great wax for the money 5 Easy to apply and a breeze to remove. If you liked Pinnacle Souveran you will love this. The gloss and depth are fantastic. Mckee's carnuba paste wax 5 Finally a high quality wax at a reasonable price that exceeds your every expectation! Incredible 5 As a former user of Pinnacle wax, I was pleasantly surprised at the incredible performance offered by Trademark. As good or better at half the price. Incredible wax! Quality Wax 5 There are lots of premium waxes on the market, add this one to that list. It goes on butter smooth and wipes off effortlessly no need to let it haze, just wipe on and wipe off. The shiny is great. Its a very easy and pleasant wax to use. Pros:Great shine, super easy to use, a little goes a long way. Pros:Very easy on and off. Outstanding shine. Great wax! 5 Wow! Easy on - easy off. Holds it's own with the best of waxes. The shine is exceptional. And so far in the Florida sun, after 2 months, it still beads like I waxed yesterday.